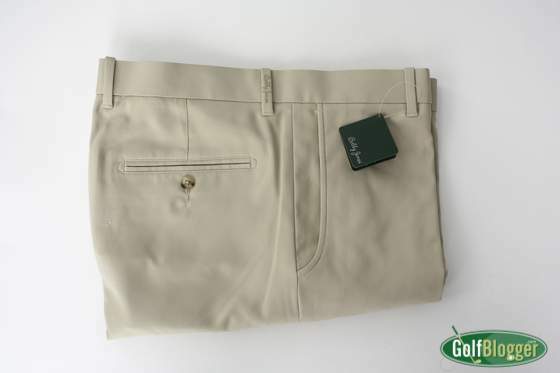 Bobby Jones’ Flat Front Tech Shorts are a great short for walking eighteen holes on a hot day. The shorts are light, without feeling insubstantial. That apparently is not quite as easy a trick as it sounds; many summer-weight shorts in my drawer feel as though they were cut from some sort of gossamer. I sometimes feel nearly naked playing in them. As is usual with the Bobby Jones line, I found great attention to detail. 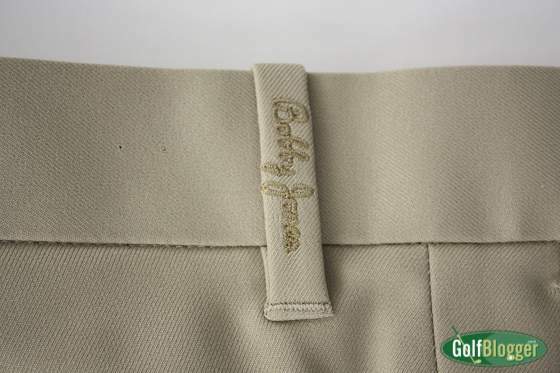 Little things, like the Bobby Jones signature on the belt loops give Bobby Jones apparel an air of quality. Mrs. GolfBlogger, an accomplished seamstress, gave the fit and finish of the shorts her seal of approval. One design feature I really like is the quarter-top pockets. I thought these made it easier to get things like greens tools and ball markers in and out of the shorts. The sizing of the Bobby Jones shorts is a bit on the slim side. I ordered my usual waist size, and found the shorts were a bit tighter than I like. The mechanical stretch fabric loosens up a bit as you wear them. Still, if you like a looser fit, I suggest getting a size larger than usual. The 9 1/2 inch inseam is perfect for my legs.